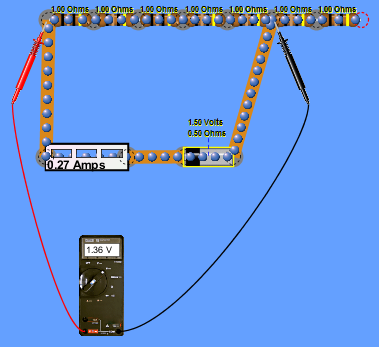 Using the Phet DC circuit simulation it is possible to construct the same circuit. Because this way works so well it helps understand the theory so is maybe worth doing instead of the real version.Here the series resistors represent the resistance wire, each resistor having a resistance of 1 Ω. The EMF of the battery is 1.5 V and the internal resistance 0.5 Ω.This leads to the following table of results.